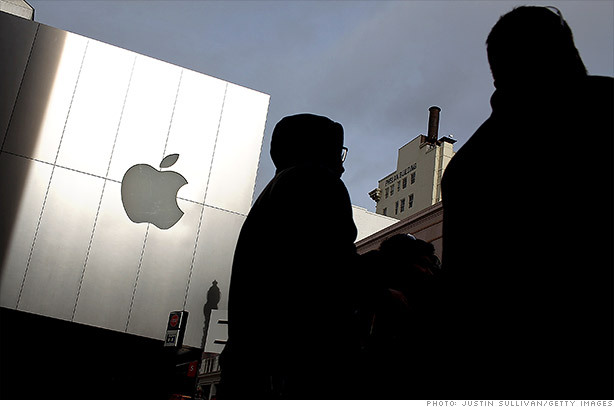 These are dark days for Apple investors. Apple (AAPL) and the broader stock market are once again at odds. When the S&P 500 (SPX) and Dow Jones Industrial Average (INDU) have ticked up, Apple tends to move lower. As many traders have pointed out, Apple has been trading inversely to the market and its rival Google (GOOG), the maker of the Android operating system. On Tuesday, Apple's stock dipped roughly 0.4%, while the S&P and Dow moved closer to their 2007 peaks. Google jumped 1%, hitting its all-time high. Sadly for Apple's shareholders, it's been on this losing side of the equation a lot lately. Apple is down 14% in 2013, while Google is up that much this year. Apple bears were quick to write the iPhone maker's obituary. Our boss pointed out a story by CNNMoney's David Goldman that discussed Apple's search for its next hit product. Others noted that even if Apple isn't dead, others have caught up. Traders expect Apple to continue to lose its innovative edge and move further downstream to target consumers looking for the lowest prices. But even if the iPad maker gains new customers in China, will Apple be sacrificing profits to grow its sales? That's what investors seem to be betting as they run away from Apple's stock.